How will the resourceful and devoted Autobot warrior wield the power of the Primes? Well, that says nothing, doesn't it? In Generation 1, Elita-1 was Optimus Prime's girlfriend/sister, left behind on Cybertron when the Autobots fled, a resistance fighter against the Decepticons for millions of years. In the modern comics continuity, she's the iron-willed captain of a prison ship dedicated to holding prisoner an ancient evil, adrift in space for an even longer time. So no matter what, she's always a badass. 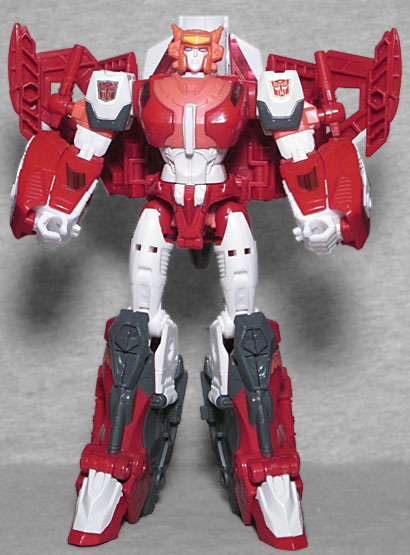 Originally, Elita-1 was a typically feminine-presenting character: small, slender, curvy, basically everything a 1980s cartoon would have her be. This toy of her, however, is a retool of the Voyager Class Starscream figure, so she's nearly as large and burly as he is. In reality, almost none of the same pieces are used - she carries over his engineering, but the molds are overall less blocky than his were. 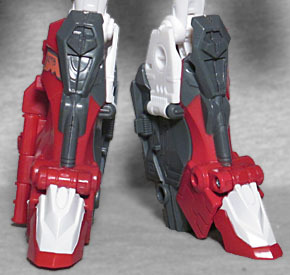 Look at the legs, for instance: Starscream's shins are mainly straight lines, with bent angles to create the shape, while Elita's have curving shapes, smaller knees, and generally look narrower from side to side; his thighs and hips are squarish, but hers are oval. The shoulders aren't as wide, the waist is narrower, the forearms don't look as heavy... it's lots and lots of changes that add up to make her more than just another Seeker repaint. 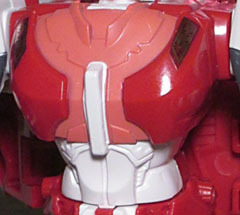 The design of the toy's new chestplate is based on the old animation model, with a short collar around the neck, a vertical bar down the center, curved red panels wrapping around from the sides, and a white abdomen with varios curving shapes coming together like musculature. It's not a direct one-to-one parallel, but there are strong enough connections to make the inspiration clear if you know about it. Of course, the head is almost a direct lift from the old cartoon. 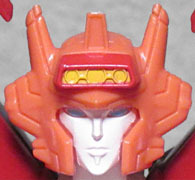 All the femme-Autobots introduced in 1985's "The Search for Alpha Trion" had completely goofy head designs, which may have been an attempt at hairdos or fancy hats or something, and Elita's is... really something. It has two little horns on the top, big flaps sticking out of the side like huge ears with little circular speakers molded in them, similar flares on the sides of the jaw, and a broad headlight on the forehead. "What. The eff." Say what you will, it's definitely distinctive. Elita-1 has decent articulation, with movement at the head, shoulders, biceps, elbows, hips, thighs, and knees. Her huge feet make her nicely stable in most poses, even with all the kibble hanging off her back. Her only weapons are two small pistols that can be held in either hand, or, in a step to match the old animation model, plug into his upper arms and point skyward. As a Voyager Class figure in 2018, she also comes with two pieces of "Prime Armor" that can plug onto the toy, but look really stupid if you do. There's also an "Autobot Enigma," which is apparently the thing that powers the ability to combine. 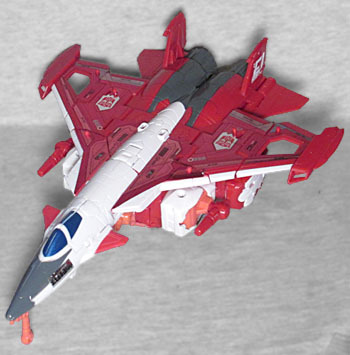 In the '80s, Elita One converted into a car, but since this is a retool of Starscream, today she's a plane. It kind of makes sense, in a way: since she's a leader among her people, it would totally track that she'd reformat into a larger, more intimidating body. After all, isn't that what women do? Give up the things they want in favor of everyone else? Think about your mom, always letting someone else have the biggest slice or the prettiest plate. So even if she would have rather remained a car, you can almost hear her sighing and saying "fine, I'll do it, I'll turn into a plane. No, no, it's fine, don't bother yourself, I don't need to be a car anyway." Unless it was actually something she wanted, and then, hey, more power to her! 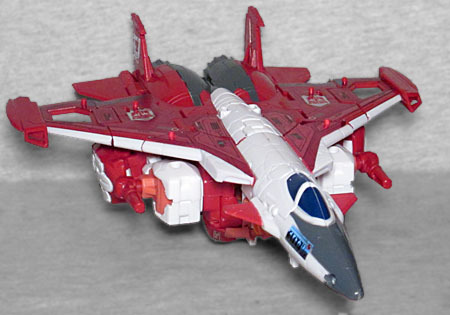 There are fewer differences between Starscream and Elita in this mode than there were in the robot modes - it's really just the tailfins and the wing tips, which have hollow gaps in them. A piece of landing gear folds out from under the nose, but it sits oddly far forward, and there are no matching wheels at the back (just bumps on her folded up feet). 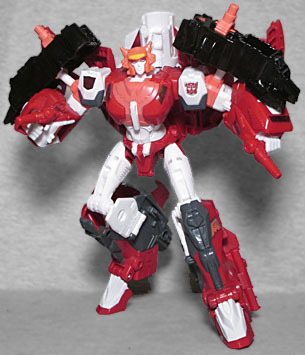 Elita's colors carry over from the robot mode, all red and white and pink and grey. Sadly, all the fine details are done with stickers, and they work just as badly here as they did on Broadside. Apparently Hasbro has said they'll be stopping the stickers going forward, but that doesn't anything to improve Elita-1 today. 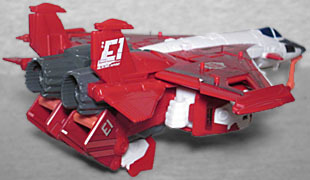 There are labels reading "ELITA" by the cockpit and "E1" near the tail. In fact, the E1 decorations on the tailfins are tampographed, making them tons better than the stickers. Like Battle Core Optimus Prime, Elita-1 turns into a torso mode that I'll likely never use. For a combiner named "Elita-Infin1te." Maybe if there were more Femmebot combiner limbs, I'd care, but there's only one, so I don't. 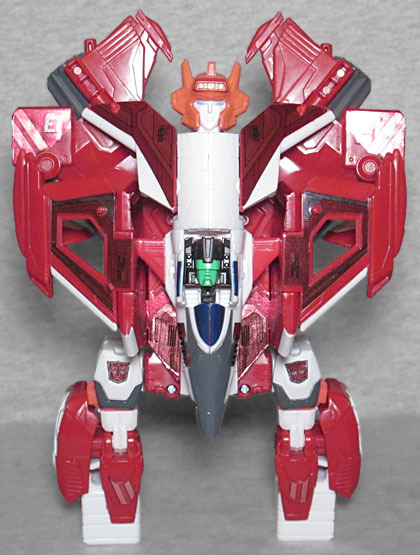 The mold's origins as Starscream are really evident here, because the torso looks a lot like movie Starscream. The cockpit opens so you can plug the Enigma in there, or any other Headmaster-sized piece. In a truly awesome example of uncreativity, Elita-Infin1te's head is just Eilta-1's head, done larger and with more intricate details. Really? They couldn't come up with anything else? I mean, right off the top of my head, do the ponytail look that Ariel (the Orion Pax to Elita-1's Optimus Prime) sported. It may not be very intimidating, but at least it would look different. We do kind of wish that there was a way to display the combiner head on the normal body, because as it is, the robot mode's head feels slightly too small. Some folks reported finding this toy in February, but out here in the real world, she's just started showing up in the past few weeks. But hey, better than not showing up at all, right? "Power of the Primes" has now released three female Transformers, none of whom have had mass-market toys before, one of whom is an entirely new character, and all three of whom are different sizes/body types: one Legends Class, one Deluxe, and now one Voyager. That's nice variety! Elita-1 has some problems, yes, but it's cool to finally get a real toy of her.